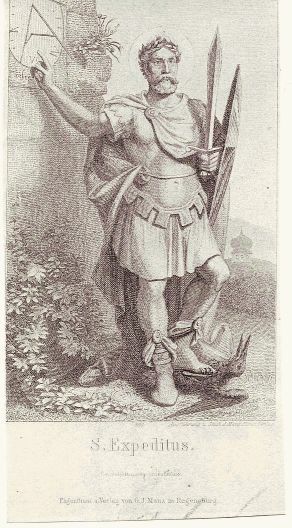 St. Expeditus also is Patron Saint of: Emergencies . Financial Success . A popular tale regarding St. Expeditus (Expedite in French) relates how a shipping crate containing relics from Roman catacombs was sent to a community of French‐speaking nuns. Their only clue to the identity of the contents was the inscription e spedito and the date. Assuming that was the name of the saint whose remains were inside, the sisters translated it to French–Expedite (Expeditus in Latin) and consequently dedicated a chapel to him. Not speaking Italian, the nuns hadn’t realized that the writing on the package actually referred to the shipping date. There is only one famous statue of him in North America. It is in New Orleans, where he enjoys a great reputation for “expediting” spiritual favors. He is also believed to “expedite” payment and shipments and thus is the patron of merchants. Recently he has been adopted exofficio as patron of computer programmers, e‐commerce and those who use the internet. 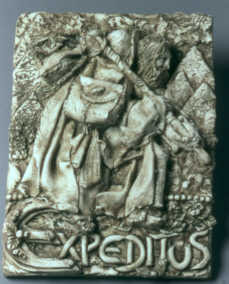 As is the case with several other popular saints, Expeditus appears to have achieved his patronage through a pun. The fact that he most likely owes his existence to errors–and errors are often made in haste–adds an ironic poignancy to the tales. Access to information and research related to procrastination. Originating from Carleton University in Ottawa, Canada, it is a compilation of information and research on procrastination from all over the world. Send us your links...we’ll be happy to publish them...as soon as we get around to it! I found out about st.EXPEDITE and it is indeed a blessing.